For the Scottish badminton player, see Martin Campbell (badminton). 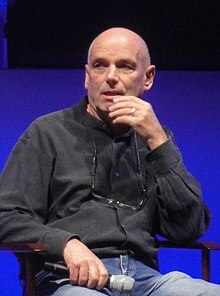 Martin Campbell (born 24 October 1943) is a New Zealand film and television director based in the United Kingdom. He is best known for directing the highly-regarded British miniseries Edge of Darkness (1985), for which he won a BAFTA, and the Bond films GoldenEye (1995) and Casino Royale (2006). He also directed The Mask of Zorro (1998), The Legend of Zorro (2005), Green Lantern (2011), and The Foreigner (2017). On television Campbell directed the film Cast a Deadly Spell and had overseen some of the more action-oriented episodes from the TV series The Professionals (1977–1983); however, his best-known work is the 1985 BBC Television drama serial Edge of Darkness, for which he won the British Academy Television Award for Best Director in 1986. Campbell has also directed a movie remake of Edge of Darkness, starring Mel Gibson and Ray Winstone, and released in 2010. Campbell directed the first episode of the US TV series, Last Resort. ^ Nair, Drishya (19 June 2011). "Martin Campbell says director Forster messed up 'Quantum of Solace'". International Business Times. Retrieved 14 December 2018. ^ "Birds Remake Director Martin Campbell Flies the Coop". DreadCentral. This biographical article related to film in New Zealand is a stub. You can help Wikipedia by expanding it. This article about a film director is a stub. You can help Wikipedia by expanding it.